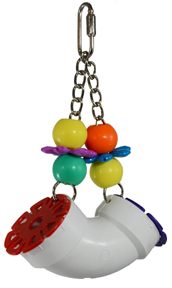 Lots of mini birdie bagels with plastic curly cues dangle from a bright plastic chain. 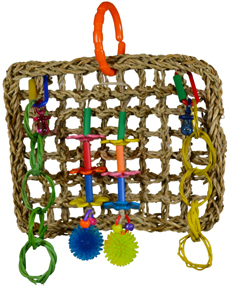 This bird toy is made from a vine twist, abc blocks, munch balls, pony beads, and a bell. 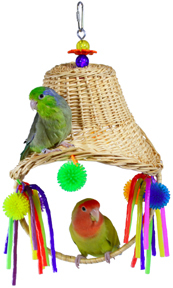 Tons of shredding fun! 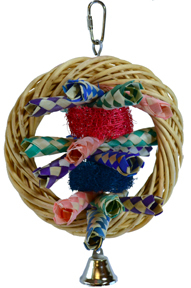 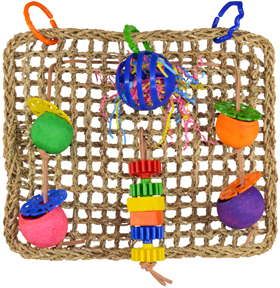 Munch balls, vine rings, shredded crinkle paper, and a woven hat make up this fun bird toy. 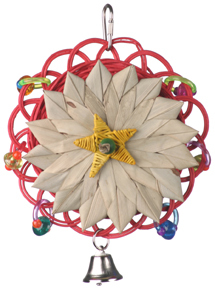 Woven maize disks adorned with colorful wood parts and crinkle shred paper, complete this destructible toy. 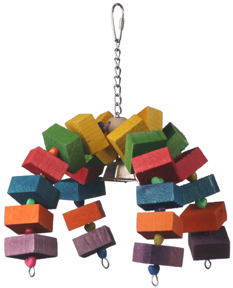 The arch bird toy is made of pine wood blocks, pony beads, and 2 bells. 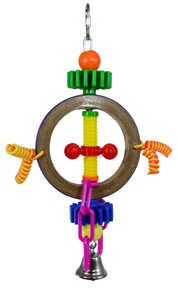 This bird toy has vine rings and plastic shapes with a bell. 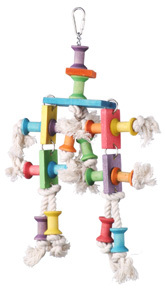 12 Diamond shaped pine wood pieces separated by wooden balls with hooks on both ends. 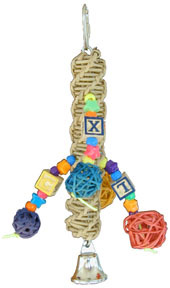 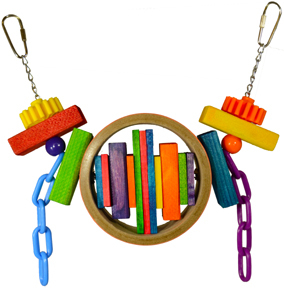 A fun crunchy toy with lots of shreddable finger traps, whiffle balls, plastic chain and a bell. 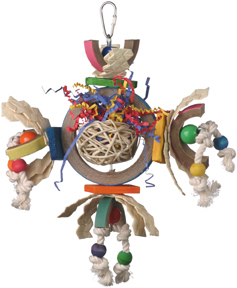 Hide treats inside the paper fingers and the whiffle balls to create a wonderful foraging toy. 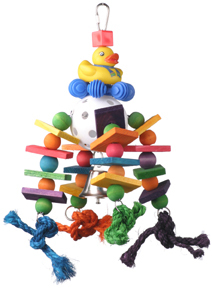 Your bird will enjoy all of the shaking and rattling action offered up by this toy which consists of three tiers of plastic wheels with over 60 fun plastic "danglies" attached. 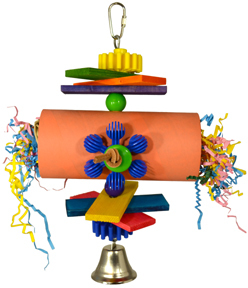 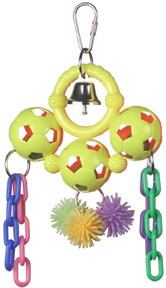 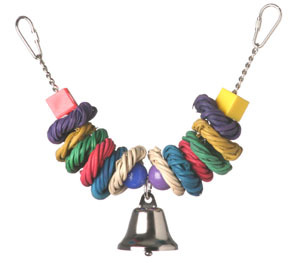 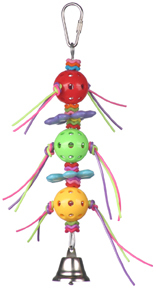 With 4 cowbells and color, this toy is designed for the bird that loves to ring the bells. 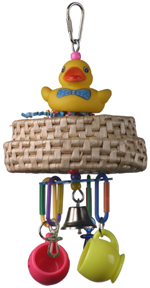 adorned with cute rubber duck and smily face mugs. 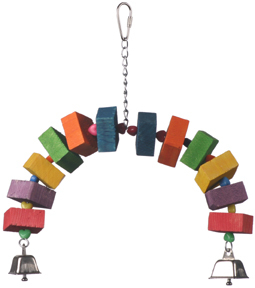 The double arch has lots of pine wood blocks, pony beads, and a bell. 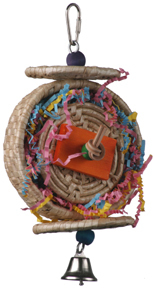 paper shred. 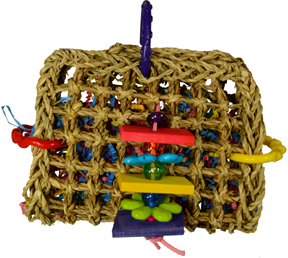 The core is surrounded with lots of moveable parts including balsa slats, cardboard bagels, palm braid, knotted cotton rope and vibrant wooden and plastic beads. 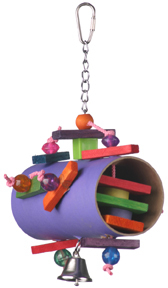 This cardboard cylinder has attached wood pieces, plastic pieces, and a bell. 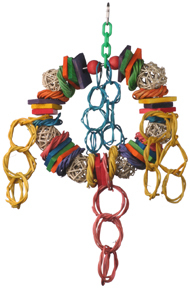 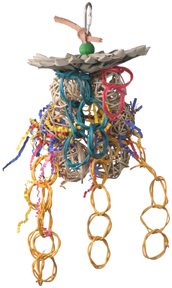 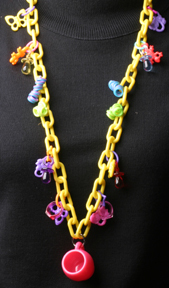 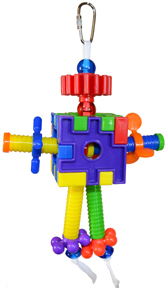 Brightly colored wooden shapes are decorated with hanging plastic chains and four separate strands of pine blocks and beads. 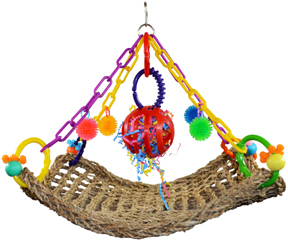 Your bird will enjoy chewing, perching and hanging on this versatile toy. 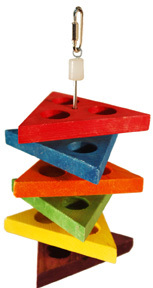 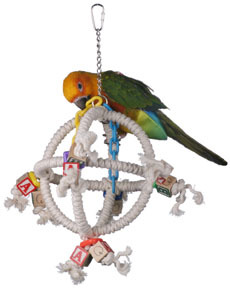 This bird toy is sure to be a hit with your parrot. 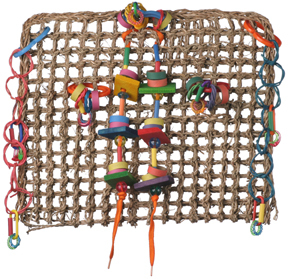 Four separate strands of wooden slats and beads hanging on a whiffle ball give an abundance of opportunity to chew, crunch and shred. 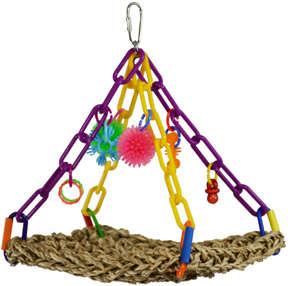 This bird toy is made of munch balls, pine wood slats, vine rings, and plastic chain. 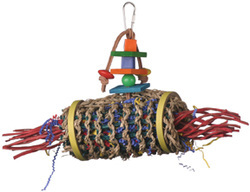 Your bird will love crunching on this toy. 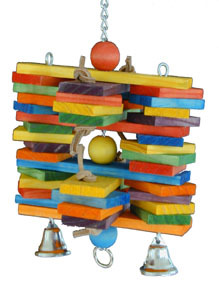 This toy has a pile of pine wood slats for the bird that loves to chew wood. This cotton rope atom has attached ABC blocks and plastic chain. 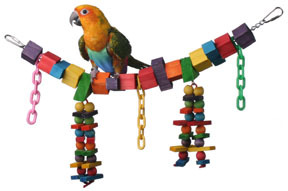 Your bird will love climbing, swinging, and preening on this fun toy!